A new agreement between Charles Sturt University (CSU) and seven farming systems groups will foster research, development and extension opportunities to benefit farmers, businesses and agricultural students. The partnership, delivered through the Graham Centre for Agricultural Innovation, is a strategic alliance to support the future of farming across the Central West, Riverina and north-east Victoria. It brings together CSU, Central West Farming Systems, Holbrook Landcare Network, FarmLink Research, the Irrigated Cropping Council, Southern Growers, Riverine Plains and the Irrigation Research and Extension Committee. CSU Deputy Vice-Chancellor (Research Development and Industry) Professor Mary Kelly said this new agreement expands the number of farming system group partners from four to seven. "Charles Sturt University values collaborations such as this to deliver research and extension that has real impact to better our communities," Professor Kelly said. Graham Centre Director, Professor Michael Friend said, "The partnership shows we are committed to working with agricultural industry, from grassroots along the value chain, to improve the productivity, profitability and sustainability of our red meat and grain industries. "We're delighted to be expanding the alliance to share our expertise and grow connections, in particular with irrigated farming systems." Chair of the collaboration, FarmLink, Chief Executive Officer Ms Cindy Cassidy said, "We recognise the unique skills and expertise that exist within each organisation. "Working collaboratively together through this agreement we are able to enhance and add value to the work that we do to support farmers and the students who will go on to be part of our agricultural sector in the future." The Farming Systems Partnership agreement was formally signed on Friday 17 February. The Graham Centre for Agricultural Innovation is an alliance between CSU and the NSW Department of Primary Industries. Professor Michael Friend is based at the Graham Centre at CSU in Wagga Wagga, contact CSU Media for interviews. 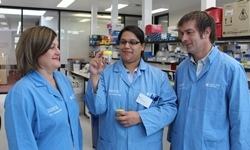 Photo: Ms Cindy Cassidy, Farmlink, Ms Esther Callcott CSU PhD student, andProfessor Michael Friend Graham Centre Director.